Danyal was taking our instruction over text. We were telling him where to stand so we could capture his proposal on photo and video. We arrived an hour early to scout the location and set up. The most difficult part of our job was finding a place to hide out.. because there was no place! Polson Pier is wide open with the lake to the west and a wire fenced parking lot behind us to the east. Luckily, this is the best spot in the city to marvel at the Toronto Skyline so there were a handful of tourists with their camera's handy. 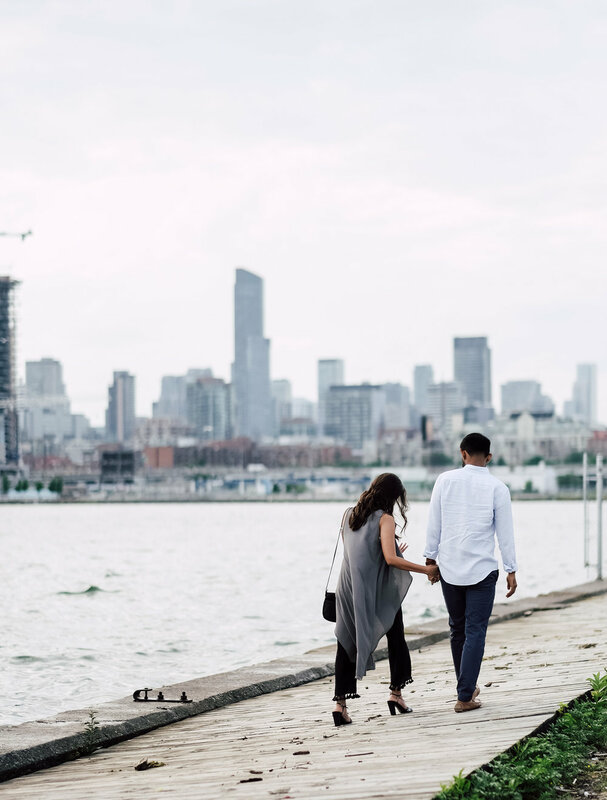 Proposal photography works best when the camera men are inconspicuous & nonchalant about their movements, otherwise the surprise will be ruined when the future bride becomes suspicious of paparazzi. We finalized our setup and texted Danyal one more time with clear, picture instructions on where to propose. The two showed up and walked casually down the boardwalk. Anxiety rose as we started filming. 3/4 down the boardwalk, Danyal looked back over her shoulder directly at us. By this time we were all ready for action!..except Arwa because she didn't know what to expect. Guess what! She said yes!